Mr. Scrumptious and I really enjoy hot and spicy food and especially so in the summer months when cooked over a sizzling, smoking grill. We both love Portuguese food for its zestiness, heat and celebration of seafood and shellfish. My husband grew up eating variations on the Portuguese/African Piri-piri and recently I took a stab at it. Much like many cultural food traditions, piri-piri recipes are handed down through family generations and each is unique. There is no one right way to do it. Here is my spin on "Piri-piri Chicken and Prawns". A few notes here: please use the best hot jarred peppers you can find and the closer to Portugal in origin, the better. Also, use extremely fresh poultry and seafood of course. Lastly, I consider the paprika crucial. I used a fabulous Spanish variety brought to me by a globe-trotting friend. Please do not use the slightly orange paprika that's been in your pantry for years. Go out and bright the brightest, freshest, most red and spicy paprika you can. Trust me, it makes the dish. Also, you absolutely must marinate the chicken at least 24 hours. If you want it incredibly tender and juicy, go for 48. The prawns are more delicate and just need 3-4 hours in the marinade. You can easily scale this recipe upward for a crowd. It's phenomenal for summer barbecues. Also, you can adjust the number and mixture of chiles to suit particular preferences in spiciness. We like it hot, so our lips are warm but not so fiery hot that one's eyes shed tears. 1. Make marinade with ingredients listed above from bird's eye chiles through cayenne pepper, placing in a large bowl and combining thoroughly. Add the chicken thighs and toss to coat. Pour the chicken and marinade into a large zip-tight plastic bag and place in the refrigerator. Let marinate 24-48 hours, turning bag every few hours. 2. About 3-4 hours before you're ready to cook, add the prawns to the plastic bag and turn several times to coat the prawns evenly with the marinade. 3. Preheat your grill or barbecue until it reaches 450˚F. While the grill is heating, remove the chicken and prawns from the refrigerator so the meats come up to room temperature. 4. When grill is ready, place chicken on first and grill a total of 8-12 minutes, depending the size of pieces and power of your grill. Turn once about 4-6 minutes or halfway through the total time. After you've turned the chicken, add the prawns and cook no more than 3-4 minutes for each prawn, just until the flesh turns pink and opaque. 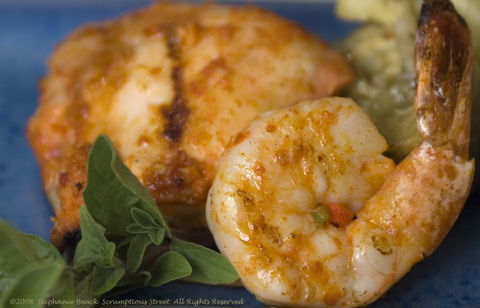 Remove the chicken and prawns and serve immediately with your favorite summer side dishes! I hope you try this simple and spectacular if you love both spicy foods and the blackened flavor of grilling. The result is complex, smoky, hot and addictive! hello,your Piri-Piri Chicken and Prawns is so cool,i really like it very much. I am a chinese food amateur and like cooking the dish myself,I'll try it,I hope I could cook this dish as yours,thanks for sharing again. Hello and welcome to Scrumptious Street! I truly hope you make and enjoy this dish. It's absolutely wonderful!